Seventeenth century painting of Afonso III. Afonso III, King of Portugal (Portuguese pron. IPA [ɐ'fõsu]; rare English alternatives: Alphonzo or Alphonse), or Affonso (Archaic Portuguese), Alfonso or Alphonso (Portuguese-Galician) or Alphonsus (Latin), the Bolognian (Port. o Bolonhês) or the Brave (Port. o Bravo), the fifth King of Portugal (May 5, 1210 in Coimbra – February 16, 1279 in Alcobaça, Coimbra or Lisbon) and the first to use the title King of Portugal and the Algarve, since 1249. He was the second son of King Afonso II of Portugal and his wife, Urraca, princess of Castile; he succeeded his brother, King Sancho II of Portugal on January 4, 1248. 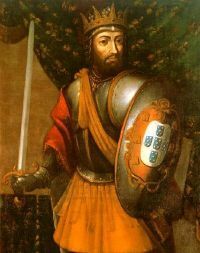 As the second son of King Afonso II of Portugal, Afonso was not expected to inherit the throne, which was destined to go to his elder brother Sancho. He lived mostly in France, where he married Matilda, the heiress of Boulogne, in 1238, thereby becoming Count of Boulogne. In 1246, conflicts between his brother, the king, and the Catholic church became unbearable. Pope Innocent IV then ordered Sancho II to be removed from the throne and be replaced by the Count of Boulogne. Afonso, of course, did not refuse the papal order and left Boulogne for Portugal. Since Sancho was not a popular king, the order was not hard to enforce; he was exiled to Castile and Afonso III became king in 1248 after his brother's death. To ascend the throne, he abdicated from his office as Count of Boulogne and later (1253) divorced Matilda. Determined not to commit the same mistakes as his brother, Afonso III paid special attention to what the middle class, composed of merchants and small land owners, had to say. In 1254, in the city of Leiria, he held the first session of the Cortes, a general assembly comprising the nobility, the middle class and representatives of all municipalities. He enacted laws intended to restrain the upper classes from abusing the least favored part of the population. Remembered as a noteworthy administrator, Afonso III founded several towns, granted the title of city to many others and reorganized public administration throughout his kingdom. Secure on the throne, Afonso III then proceeded to make war with the Moor communities that still thrived on the southern Iberian Peninsula. In his reign the Algarve became part of the kingdom, following the capture of Faro. Portugal thus became the first Iberian kingdom to complete its Reconquista. Following his success against the Moors, Afonso III had to deal with the political situation and border dispute with Castile. The neighboring kingdom considered the newly acquired lands of the Algarve should be Castilian, not Portuguese, which led to a series of wars between the two kingdoms. Finally, in 1267, a treaty was signed in Badajoz, which determined that the southern border between Castile and Portugal should be the River Guadiana. Afonso's first wife was Matilda II of Boulogne, daughter of Renaud, Count of Dammartin, and Ida of Boulogne. She had two sons (Roberto and an unnamed one), but both died young. He divorced Matilda in 1253 and, in the same year, married Beatrix of Castile, illegitimate daughter of Alfonso X, King of Castile, and Maria de Guzman. Infante Dinis (Denis) October 9, 1261 January 7, 1325 Succeeded him as Denis, 6th King of Portugal. Married Infanta Isabel of Aragon. Infante Afonso February 8, 1263 November 2 1312 Lord of Portalegre. Married to Violante Manuel of Castile (daughter of Juan Manuel of Castile). Infanta Maria November 21, 1264 June 6, 1304 Nun in the Convent of Saint John in Coimbra. Martim Afonso Chichorro c. 1250 c. 1313 Natural son; Married Inês Lourenço de Valadres. Afonso Dinis c. 1260 a. 1310 Natural son; Married to D. Maria Pais Ribeira, Lady of the House of Sousa. Leonor Afonso c. 1250 1291 Natural daughter. Married twice: first to D. Estevão Anes de Sousa (without issue), second to D. Gonçalo Garcia de Sousa, Count of Neiva (without issue). Gil Afonso 1250 December 31, 1346 Natural son; Knight of the Order of the Hospital. Rodrigo Afonso 1258 about May 12, 1272 Natural son; Prior of the city of Santarem. Leonor Afonso (nun) ? 1259 Natural daughter; Nun in the Monastery of Santa Clara of Santarem. Urraca Afonso 1250 November 4, 1281 Natural daughter; Nun in the Monastery of Lorvão. Statue of Afonso III in the city of Faro, Portugal, in the Algarve. Afonso III was the fifth king of Portugal and reigned from 1248 until 1279. He is best remembered for completing the reconquest of the West of the Iberian peninsula, that is, of Portugal, and for the style of his government. At a time when many kings saw themselves as ruling more or less by divine right, Afonso III was prepared to share responsibility for governing Portugal. He convened the first ever meeting of a Portuguese Parliament, the Cortes, in which common citizens as well as aristocrats took part. Afonso III appears to have had a genuine concern for the welfare of his most vulnerable subjects, recognizing that they had human rights. Those who helped Alfonso III regain political control of the whole of the Algarve, the southernmost portion of Portugal and helped in the reconquest now felt that they too deserved recognition, despite their not being members of the social elite. Afonso III's contribution to the development of more participatory, egalitarian governance was modest although remarkable for his era. His consideration of his peoples sowed seeds that bore fruit of democracy in Portugal's later history. This page was last modified on 5 February 2019, at 01:04.